It’s early December, and almost all the deciduous trees in our yard are bare. That makes it easier to see some feathered friends, especially cardinals with their bright red plumage. 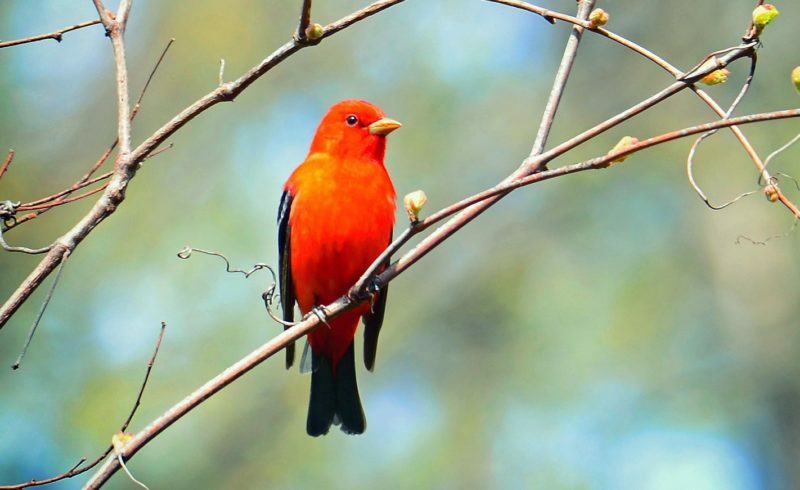 One red bird that’s difficult to spot throughout the year is the scarlet tanager. In the summer, these birds usually stay among the thick foliage of the treetops. And in the winter….well, they just aren’t scarlet anymore. Scarlet Tanagers generally spend the summer breeding months in the woodlands of the northeast. The male is strikingly beautiful with a bright red body, black wings, and black tail. In stark contrast, the female is a yellowish-green color. Scarlet Tanagers eat mostly insects, including moths, beetles, wasps, bees, dragonflies, and termites. They will also feed on some spiders, snails, and worms, as well as wild fruits and berries. Female Scarlet Tanagers choose the nesting site, often fairly high off the ground (50 feet or more). They lay three to five (usually four) pale blue-green eggs in a shallow nest made of twigs, weeds, and grass. In approximately two weeks, the eggs hatch, and both parents feed the hatchlings. Nine to fifteen days later, the baby birds are ready to leave the nest, although they are still cared for by one or both parents for a couple more weeks. In the fall, Scarlet Tanagers begin their migration towards northern South America, where they will overwinter. As they travel, they can be found in the southeastern half of the United States. During this time they use open spaces such as parks and gardens, sometimes feeding on the ground and around shrubs. It’s also during this time that the males trade their beautiful red feathers for yellow-green ones. The following spring, the Scarlet Tanager will be red again!